Anyway, I just finished the fourth book of the series, The Fall of Five, and I’m REALLY ANGRY, that I have to wait to get more of the story. I seriously haven’t had to wait for the next book in a series to come out since Harry Potter… and Eragon, but I kind of gave up waiting with Eragon. It’s an old feeling, but I love feeling it again. I’ve been a little dry with reading lately, but this series threw me headlong into the frenzy again. 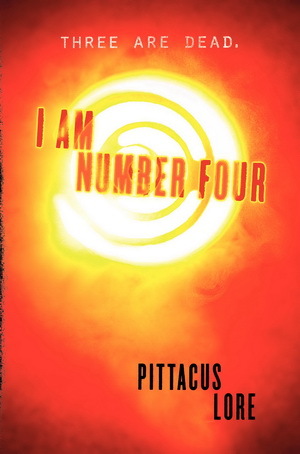 It’s thrilling and fast-paced, though it doesn’t seem like it for the first book and a half or so. There’s mystery and intrigue and STUFF. I nearly (well I say nearly…) flipped out in my chemistry class today when I reached the end of it. I was seriously put out. I’ll be going back to the Redwall series now, but I won’t soon forget this series. It’s great and I highly recommend it to PEOPLE. This book is my favorite book. I always forget that whenever I’m not reading it, but when I am, I know that it’s my favorite. The first time I read it, my brother lent it to me and I spent years afterward looking for it. When I finally did find it, there were two copies at the local DI, which seemed unfair to me since I had been looking there for so long. You will like this book if you like time travel. The time travel in this novel represents what I believe time travel would be if it were possible, no matter how much I love Doctor Who. It’s hard to explain just why this book is so fantastic to me, but I think it’s mostly due to the connection to the past. I think a lot about the past and a lot about the effects of changing things in the past. There’s this fantastic motif of how knowledge and hindsight can affect how decisions are made. One thing that kind of bugged me was this idea of destiny that kept coming up throughout the book. It did make for a more robust plot, but otherwise, I disagree with the idea of destiny for the most part. There isn’t a lot I can say about why the book appeals to me without spoiling it. Anyway, this book should be read by you. All of you. Now. I haven’t done a book review in a long time. I remember swearing that I was going to do more of them, but then I didn’t. In any case, I want to do one now for no particular reason. This book came into my possession by interesting means. I first heard of this book from a psychoanalyst (psychiatrist to you primitives). This particular guy was a very interesting guy and he made a distinct impression on me. Though he didn’t cure me of my anxiety, he did have a lot to say about literature. His favorite book to talk about was Crime and Punishment by Fyodor Dostoevsky, which I actually got to read a few months later in my AP Literature class. It is also now one of my favorite books. Ever. It really is fantastic, though my classmates will tell you otherwise. This book, however, was another book he spoke about once. I’m pretty sure that, at the time, he couldn’t remember the title of the book, but he described the plot of the book to me, which I thought sounded pretty interesting, for the purposes of the conversation we were having at that point. Around four months later, I stopped going to therapy and continued on with my happy little life. This was around the time when my friend Leslie and I started hanging out a lot after school. Up to this point in our friendship, we were simply far too lazy to “hang out”, but now we had devised a master plan for Halloween costumes and did a lot of running about in order to make it happen. One of the things we started doing frequently, was shopping at the local DI (Deseret Industries), where the used books were only fifty cents to a few dollars and usually had plenty of the books that we were looking for. Within the next year, my personal library increased in size by a factor of around four or five. In short, I obtained two new bookshelves for my bedroom and finally had enough books to organize them into some sort of order. One day, Leslie and I were preparing for college. We cleaned the room that her grandparents are going to let us live in, we built our fantastically stylish bunk beds, and we mapped out where we were going to cram all our stuff (books). By way of reward, we treated ourselves with a trip to DI. As always, we made our way to the back corner that housed the books and began methodically sorting through the books to see if they had any that we wanted. I was going along a shelf when I reached a book entitled, “The Portable Therapist.” Because of the general attitude that my social circle has toward therapy, I picked it up to look at it, bemused. Putting it back, I saw the book pictured above. 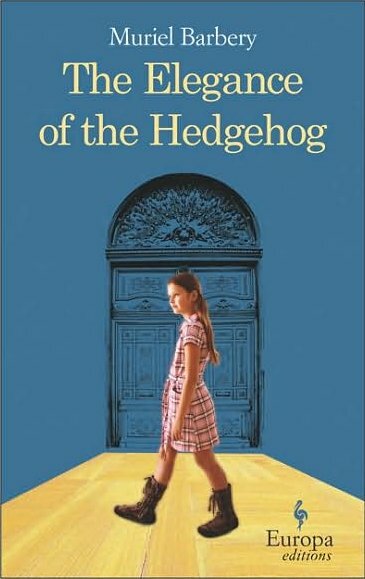 Not knowing the title of this book in relation to the story line, I picked it up, mostly because I like hedgehogs. They’re adorable. 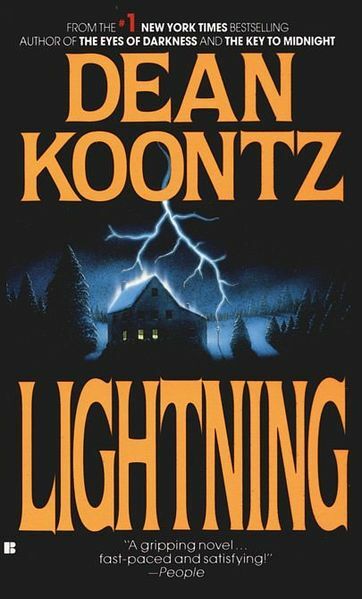 Reading the description of the book’s plot, I quickly realized that this was the book that my therapist had been speaking of all that time ago. I looked back down at The Portable Therapist and laughed at the coincidence. Then I bought both books, of course, to commemorate the occasion. Having just read it, I understand perfectly why my therapist would like this book. I’m something of an intellectual, yet half of the words in the book were words that I wasn’t familiar with. Not to mention the syntax was so complicated that I even had to re-read sentences. It was also incredible in that the main characters were constantly obsessing about grammar. Anyone who feels so strongly about grammar has a place in my heart. Another thing about this book made an impression on me. That thing was the fact that, throughout the whole book, the main character (a little girl) was planning her own death. She gave very well-thought-out reasons for her suicide and was very convinced that her course was the right one. However, throughout every one of her arguments, I was constantly disagreeing. This isn’t a specifically individual reaction, but it was important to me. My state of mental health has never been…. ideal. I was in therapy, you can make your own inferences. It was just important to me because it assured me of my own will to live. I’m not suicidal. I never thought I was, but something about knowing for sure is strangely comforting. Anyway, this book is a spectacular read, if you can keep up with the advanced writing. It’s a very nice “meaning of life” book, if you’re into that sort of thing. What impressed me about this book is specified in the Introduction (Hardcover second edition or something like that). The author was talking about how some people complained because they didn’t think that real children talked the way that the children in the book did. Having been an EXTREMELY gifted child (I’m kidding), I remember thinking in some of the same ways as these children in the book did, except for that I wasn’t smart enough or able to think about one thing long enough to reach any sort of conclusion. I think that real children have the inclination to think like the kids in this book, but there is too much pressure on them to think the way that adults think they should think. Children are sheltered from thinking about things that adults don’t think that children should have to think about, so they don’t think about them. The reason I liked this book for the most part is the way that Ender became so tired all the time. Not physically, but mentally. He got tired of “the game” and he realized that he didn’t really have to play it or even play by the rules of it. Fortunately, for him, he was in a situation where the adults who were trying to control him almost wanted him to realize this stuff because they needed him to think a certain way (which was incredibly rude of them, but there you are). This way of thinking does not, however, work in the real world very well. (I realize that this has NOTHING to do with the book, but I like books that make me think and what I think about as a result of reading the book might not have anything to do with the book at all. Just bear (bare beer bair?) with me.) The point of this is that I’d much rather not do something that might be good at the beginning but then turn horribly wrong (I will most likely end up an old maid). In my opinion, unlike Charlie Fink (or whichever band member wrote the song), the beginning isn’t worth it if you’re just going to end up miserable. I’m not the person who is able to be glad that something happened. I’m the one who is sad that it’s over. (Yeah, I’m lame). This was another book recommended to me by my Seminary teacher. It’s hard to describe what the book is about because (as the book is constantly proclaiming) it has no unifying theme. It’s really just a bunch of economical questions that are analyzed (not necessarily answered) using data and logic. 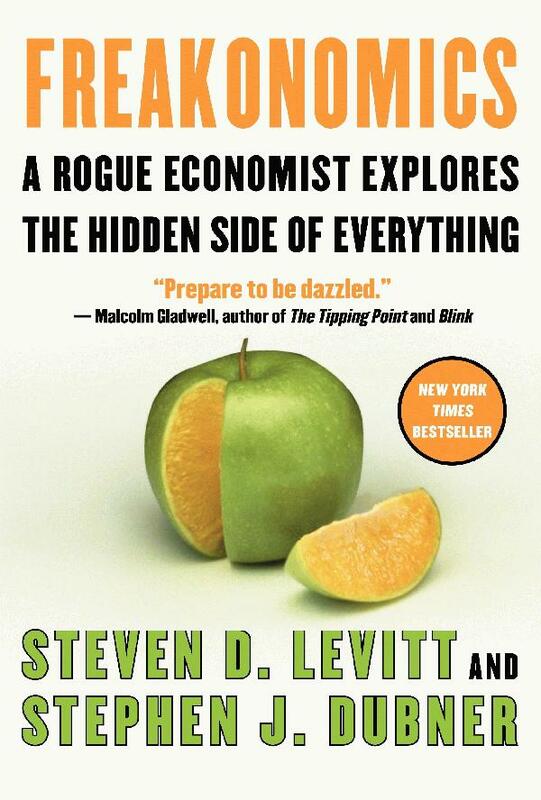 It was a very interesting book, overall, and I learned a lot about… well, stuff, anyway. I’ve always been semi-fascinated by the way that people have been programmed to look at things and the way things seem after looking at them logically. Also, analyzing things without moral biases and without trying to come up with a right or wrong answer. Though, I think the best part of the whole book is probably the cover. Blogging/doing email quizzes really doesn’t work well when you’re watching Newsies. Probably because the music is so catchy and they’re accents are hilariously awesome. Also, the choreography is just too awesome to not watch, so every time they start singing I either have to type without looking (at my fingers AND at what I’m writing. It’s amazing that something intelligible even comes out) or I have to pause and watch. Then I lose my train of thought and my writings don’t make sense (not that they did in the first place). I recently (actually, like ten minutes ago, before I started watching Newsies) finished the book Outliers by Malcolm Gladwell. We talked about this book in Seminary. It’s the book where the Seminary teachers got the 10,000 hour rule. I decided to read it because several of them said they recommended it (and teachers usually know what they’re talking about when it comes to books). At first, I downloaded a PDF file of it and it took me a month to get half way through. Then, yesterday, my mother got the book for me from the Bookmobile, and I finished the second half in less than 24 hours (Yay for real, physical, paper books! ).